Pushing the boundaries of Japanese musical tradition while respecting its invaluable essence, Nagata Shachu takes advantage of this tension to produce astoundingly forceful and poignant compositions. 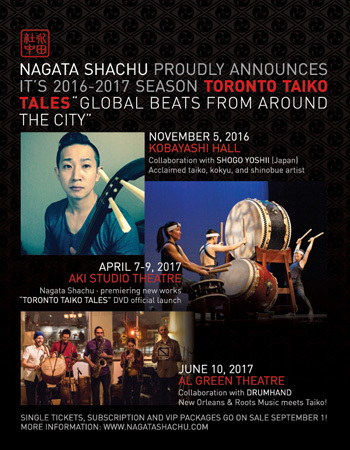 Come hear their newest pieces as they perform in the Aki Studio Theatre in Regent Park for a series of concerts that reach out to this vibrant community in the heart of Toronto. The weekend will also officially launch their new DVD on which they celebrate the rhythms they feel pulsating in the city they call home.